Fabio becomes the fifth hurricane of the season more than a month ahead of schedule. At 200 PM PDT / 2100 UTC the eye of Hurricane Fabio was located near latitude 15.6 north longitude 111.4 west about 515 mi/825 km S of the southern tip of Baja California. 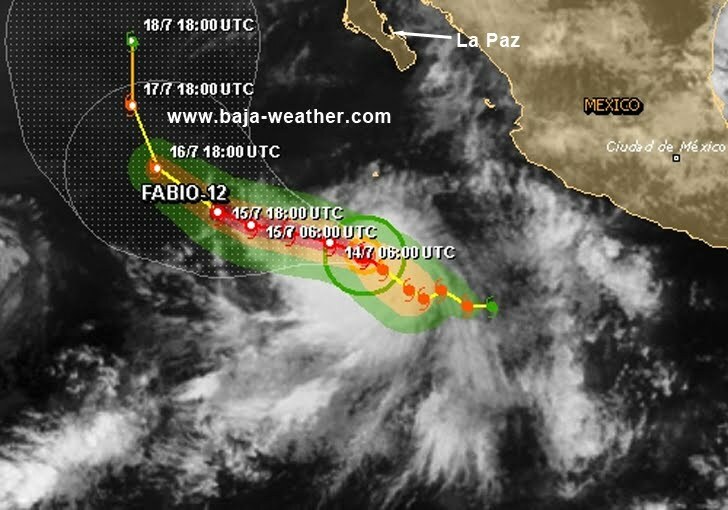 Fabio is moving toward the west-northwest near 10 mph - 17 km/h and this general motion is expected to continue for the next couple of days. Maximum sustained winds have increased to near 80 mph - 130 km/h with higher gusts. Fabio is a category one hurricane on the Saffir-Simpson hurricane wind scale. Some additional strengthening is possible during the next 24 hours or so. Hurricane force winds extend outward up to 25 miles - 35 km - from the center and tropical storm force winds extend outward up to 105 miles - 165 km.